Iba pang impormasyon Complete line for sawing and cutting wood: Composed of: Machine 1: Saw disc 2-speed cutting, Make: Storti, Year built: 2000, diameters: from 140 to 350 mm; Machine 2: Film Saw Vertical, frilly diameter 1400 mm; Brand: Jocar, Year: 1999, Control Console: Mudata; Line speed: 12 pieces / min. 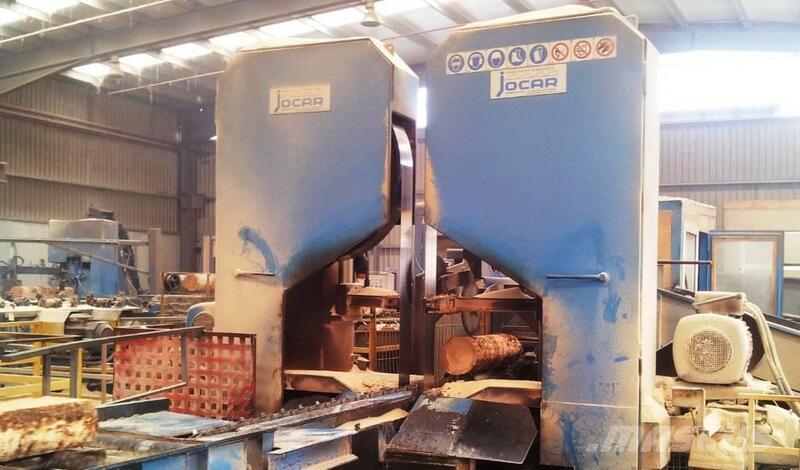 Machine 3: Sierra Desdobladora Tape Horizontal; Frilly diameter 1400 mm, Brand: Jocar year: 1999; Machine 4: 2 Edger machine; Brand: A.Costa, year built: 2013; maximum height: 150 mm; With positioner at the entrance. Machine 5: Nuclei milling machine; maximum height: 150 mm; Brand: Inasema, manufacture year: 2013. Includes 2 cutting discs. Machine 6: Multiple saw cutting machine; maximum height: 200 mm; Brand: Storti, year built: 2000; With 2 engines of 90 KW each. Machine 7: Edger Coastal; With automatic centering; Brand: ACN year: 2001; Line speed: 20 pieces / min. Machine 8: Coastal milling machine; Brand: Inasema, year built: 2013; Automatic control. Machine 9: Multiple Sierra 2 vertical axes; Two cutting discs; Brand: Storti, year built: 2000; 2 engines 60 KW each; Range: 70 to 150 mm.